Special Events: Disney's Hollywood Studios Turns 30 on May 1st. Special celebrations coming to Disney’s Hollywood Studios for the park’s 30th birthday. Stay For the Debut of “Wonderful World of Animation” – The park’s new nighttime projection show will light up the park for its official debut on May 1, 2019. You can watch in wonder as the façade of the Chinese Theatre is magically transformed – displaying this stirring tribute to animation. Behold spectacular sequences celebrating themes like magic, family, adventure, romance and friendship. Each theme is brought to life through unforgettable moments from beloved films—like “Sleeping Beauty,” “The Incredibles,” “Coco” and many more. The show will debut at 9:05 p.m. ET, just prior to the park’s “Star Wars: A Galactic Spectacular” fireworks show. Taste Special Food & Beverage Items – A slew of special anniversary food & beverage items will be available throughout the park, including Kylo Ren Cupcakes, Incredibles Macarons, Tres Leches Verrine and many more. Disney After Hours Event Night has been added to the schedule for May 1, 2019. Attendees can experience little to no-wait on park favorites, including The Twilight Zone Tower of Terror, Rock ‘n’ Roller Coaster Starring Aerosmith, Toy Story Land attractions and more. Additionally, this special anniversary edition of Disney After Hours will feature some beloved Disney characters ready to greet guests in the Chinese Theatre Courtyard, at Star Wars Launch Bay and more. There will also be a special encore performance of “Wonderful World of Animation” taking place exclusively for event attendees. Tickets are available via the Disney Travel Agents website. Please view Training & Benefits > Commissions for commission information. According to the Walt Disney World Resort, capacity for Disney’s Hollywood Studios, Star Wars: Galaxy's Edge and its experiences will be limited after it opens on August 29, 2019. Access to the Park, land and experiences may be restricted or unavailable depending on Guest demand and other factors. Star Wars: Rise of the Resistance attraction opens later in the year. Previously I shared that the new Disney Skyliner gondola system will be operating at the Walt Disney World Resort in the coming year. We now know that it will begin service in the fall of 2019. The Disney Skyliner will offer a new way to experience Walt Disney World Resort with unique views only available from the sky. Mickey & Minnie’s Runaway Railway at Disney’s Hollywood Studios will be using breakthrough technology to transform a two-dimensional cartoon into a real-world experience. The attraction is being built in the space formally housing the The Great Movie Ride. This is the first-ever ride-through attraction themed to Mickey Mouse and will feature a new original story and theme song as it takes guests on a journey inside the wacky and unpredictable world “Mickey Mouse” cartoons. No official opening date has been set, stay tuned! The New “Wonderful World of Animation” Nighttime Show at Disney’s Hollywood Studios will be an all-new cinematic nighttime experience beginning in May 2019 as part of the park’s 30th Anniversary celebration. According to Disney, the show will use state-of-the-art projection technology to take guests on a magical journey through more than 90 years of Disney animation. Now you can explore Toy Story Land with little to no wait times, character appearances and a delicious breakfast on select Mondays and Wednesdays from 7:30a to 8:45a. At this event, you’ll have exclusive access to Toy Story Land at Disney’s Hollywood Studios before the theme park opens. In addition, the buffet includes yogurt, cereal, fruit, assorted pastries, and more! Kids can enjoy everything on the buffet, as well as a kid’s portion of the Fried Chicken and Cinnamon Sugar French Donut or Scrambled Eggs, and both come with Sweet Potato tater-tots. Early Morning Magic at Toy Story Land is $79 (plus tax) per adult (ages 10 and older) and $69 (plus tax) per child (ages 3 to 9). Regular theme park admission is also required. For more information and to book this experience, book through your My Disney Experience account. I'm calling it, “Joy Through the World” at Walt Disney World this holiday season because there are so many holiday activities and events being offered throughout the resort. This holiday season, you can experience a Flurry of Fun at Disney’s Hollywood Studios, featuring Sunset Seasons Greetings; Jingle Bell, Jingle BAM! ; and special seasonal cheer in the new Toy Story Land. Head over to Epcot for the International Festival of the Holidays including the Candlelight Processional. Have festive fun with Mickey and the gang during Mickey’s Very Merry Christmas Party at Magic Kingdom Park. Plus if you're still looking for a hotel offer, view special offers on Walt Disney World Resort hotel rooms during this holiday season. The return of the holiday season to Walt Disney World Resort starts Nov. 8, 2018. The return of Sunset Seasons Greetings featuring impressive new laser effects and “snow,” holiday magic transforms the famous Hollywood Tower Hotel with spectacular projections of Disney Characters such as Mickey Mouse, Minnie Mouse and Olaf sharing their favorite seasonal stories. 11 World Showcase nations during Epcot International Festival of the Holidays beginning Nov. 18, 2018. One of my favorite holiday traditions at Epcot is the Candlelight Processional and this year it starts performances on Nov. 22, 2018. New this year the magic of nature will receive a holiday touch with the inclusion of Diwali, the holiday Festival of Lights in India, as part of the new live show UP! A Great Bird Adventure. Families visiting the new Star Wars-inspired hotel coming to Walt Disney World Resort will board a starship alive with characters and stories that unfold during their voyage through the galaxy – and every window has a view of space. 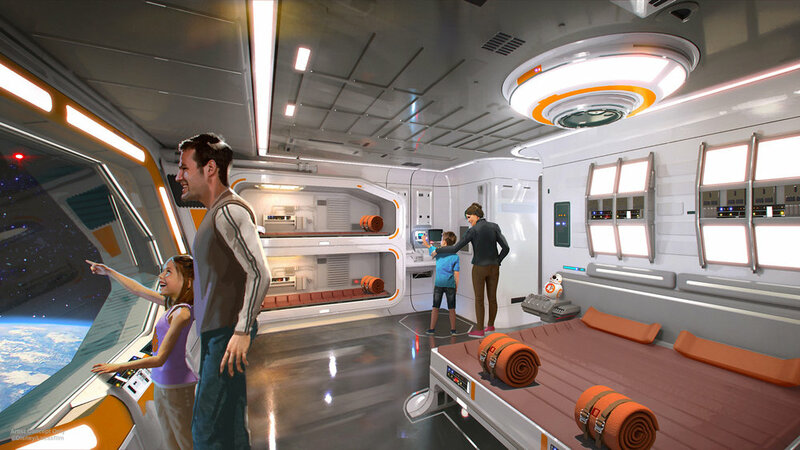 The Star Wars hotel will be different from other Disney resorts in that families will board a starship that will take them to their destination. While onboard, Star Wars characters will appear, stories will unfold for them, and views outside the “windows” will have views of space. Guests who plan a multi-night stay can participate as a resident of the Galaxy and even dress in Star Wars traditional garb. Star Wars: Galaxy’s Edge will open in late fall 2019 at Walt Disney World Resort. Stay tuned for more details. Watch “Toy Story 3” on ABC from 8-10 p.m. ET tonight plus check out their new adventure. They join a few new faces – some plastic, some plush – including Barbie’s counterpart Ken, a thespian hedgehog named Mr. Pricklepants and a strawberry-scented bear named Lots-O-Huggin’ Bear. And throughout the night viewers will have a front-row seat to the new Toy Story Land opening June 30, 2018 at Disney’s Hollywood Studios. Here's a peek behind the scenes with Walt Disney Imagineering at Toy Story Land at Disney's Hollywood Studios, opening June 30, 2018. In this this video, we see how Imagineers bring Weezy to life at Slinky Dog Dash. On select mornings now through June 30, 2018, Guests can enjoy Extra Magic Hours access to the most popular experiences at Disney’s Animal Kingdom Theme Park, including the newest attractions in Pandora – The World of Avatar, as well as Expedition Everest and Dinosaur. In July and August Guests staying at select Walt Disney World resort hotels can access Extra Magic Hours daily – yes, daily! – to experience favorite attractions at Disney’s Hollywood Studios, including the attractions in the all-new Toy Story Land. For excusive offers on Walt Disney World Resort hotels, check out the Offers Page. When it opens, Guests visiting Toy Story Land will “shrink” to the size of a toy and join in on the fun Woody, Jessie, Buzz, and Andy’s other beloved toys are having in Andy’s backyard. Here, you can take a ride on Slinky Dog Dash, a roller coaster Andy has assembled from his Mega Coaster Play Kit and topped off with Slinky and Jessie. You can also walk through a new carnival game box to experience Toy Story Mania!, which has been a Guest-favorite attraction at the park since it opened in 2008. Now expanded with a third track, the popular attraction will put even more Guests in the action taking aim at 3D objects – using everything from baseballs to cream pies – in a variety of whimsical, fast-paced games. Last summer, Disney announced plans for an immersive Star Wars-inspired resort to be built at Walt Disney World Resort. Now, more details on what this thrilling new resort, which will be seamlessly connected to Star Wars: Galaxy’s Edge at Disney’s Hollywood Studios, will be like. At the resort, Guests immediately become active citizens of the galaxy and can dress up in the proper attire. Every resort window will also have a view into space. Guardians of the Galaxy coaster coming to Epcot in 2021. 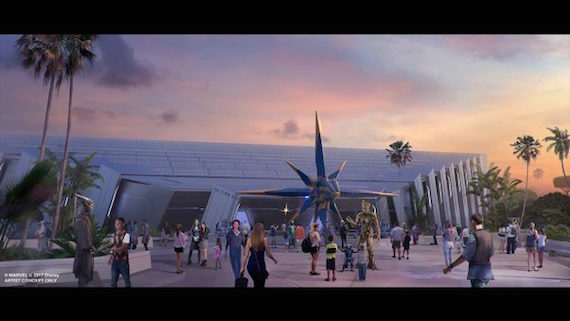 New details have been released about the “Guardians of the Galaxy”-inspired coaster coming to Epcot in 2021. This one-of-a-kind family coaster will be one of the world’s longest enclosed roller coasters inside of the former Universe of Energy show building. The Guardians of the Galaxy coaster will feature a unique story currently being created by Walt Disney Imagineering and include a new innovative ride system. The attraction will open in time for the 50th anniversary of Walt Disney World Resort in 2021. During D23 Expo Japan, Bob Chapek, Chairman of Walt Disney Parks & Resorts, shared details on a new attraction coming to Disney's Hollywood Studios: Mickey & Minnie’s Runaway Railway will feature a catchy theme song created especially for the attraction as well as a new experience that defies logic that we’re calling 2 ½-D. No glasses required. On the attraction, the fun begins when Guests see the premiere of a new cartoon short with Mickey and Minnie getting ready for a picnic. As they head out, they drive alongside a train and find out that the engineer is Goofy. Then, one magical moment lets you step into the movie and on Goofy’s train for a wacky, wild ride. Mickey & Minnie’s Runaway Railway will put you inside the wacky and unpredictable world of a Mickey Mouse Cartoon Short where you're the star and anything can happen. New details emerged today on the new Alien Swirling Saucers attraction, part of the new Toy Story Land at Disney's Hollywood Studios. You'll get to climb into a toy rocket and hang on as the little green aliens whisk you about all while set to interstellar music. Plus, if you're lucky, you just might get “chosen” by the claw. Also, Disney has confirmed that the Disney's Hollywood Studios name will not change in the foreseeable future in response to numerous rumors. Guests will be able to fly the Millennium Falcon at Walt Disney World Resort. The name of the planet in Walt Disney World's new Star Wars: Galaxy's Edge opening is Batuu - a planet on the outer rim of the Star Wars galaxy. A fleet of full-size X-wing starfighters are being built. Retail space will offer toys that appear to be handcrafted by local artisans. Galaxy's Edge will take visitors into a large-scale hangar of a Str Destroyer.